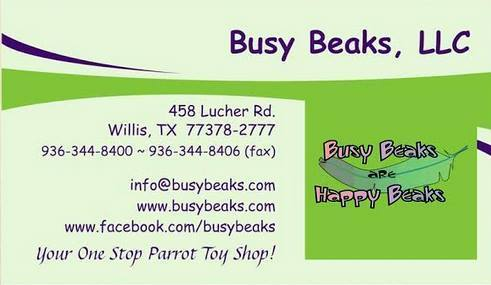 Busy Beaks is a great place to shop for your feathered friends! They support rescues, and donate many items to rescues. In addition to running Busy Beaks, (and Walkabout Station) Jan Graham Marquardt volunteers many hours to assist in auctions, and they generously donate many items to be auctioned! Every year, for an ENTIRE MONTH – Busy Beaks MATCHES donations to rescues! We can’t say enough good things about Jan, Maggie and Busy Beaks! What a wonderful way to give back to the bird community. Your support of Busy Beaks allows them to support more rescues! In retail, it’s all about space. The mores space, the more products you can offer for sale. Every square foot of space in a store has value. Yet our friends at Phydeaux generously provide a whole section of their store with a row huge boxes for donations to Marden’s Ark and MANY other rescues! They also provide space on their counter for donations jars to take cash donations. We often get donations of food, toys, and even some very nice heated perches! We love that Phydeaux supports rescues and does NOT sell animals – only supplies like treats, toys and food! We encourage you to shop at Phydeaux. We LOVE shopping at Phydeaux! Supporting them is supporting RESCUES! Does your favorite parrot like CUSTOM, HANDMADE toys? Here’s a wonderful place to get some really well-designed, made-with-love toys: Birdbabies! Jill makes some of the nicest toys you will ever find and she donates generously to rescues -giving both toys to be auctioned, AND sending gift boxes full of toys for their birds! Supporting Jill helps support rescues!